As an antithesis to GUARDIANS OF THE GALAXY VOL. 2, along comes director Jim Jarmusch’s (BROKEN FLOWERS; ONLY LOVERS LEFT ALIVE) PATERSON. 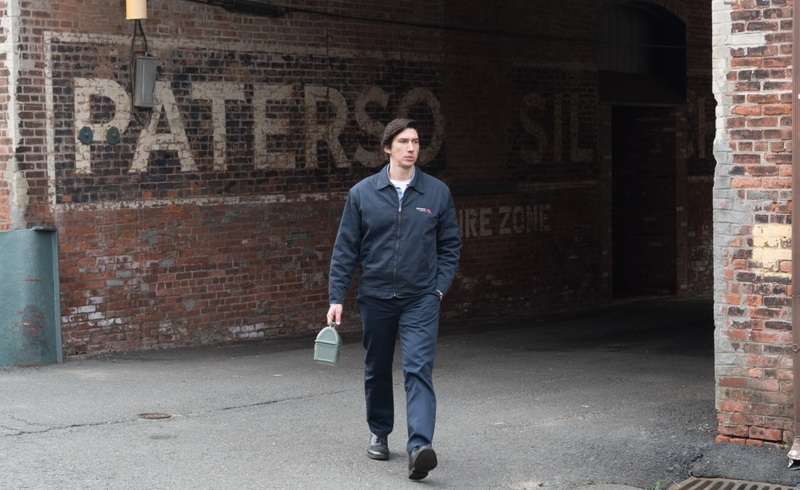 This low-key and gently meandering film stars Hollywood’s busiest actor these days, Adam Driver (FRANCES HA; INSIDE LLEWYN DAVIS; WHILE WE’RE YOUNG; STAR WARS: THE FORCE AWAKENS; SILENCE), who plays a bus driver named Paterson living in Paterson, New Jersey. Yes, you read that right. Paterson (the man) is also a poet who spends his lunchtimes and other free moments during the day writing down his thoughts, which are often inspired from snippets of conversations he overhears on his bus, the picturesque Great Falls over the Passaic River, twins, and even something as mundane as a box of matches he and his wife/girlfriend, Laura (Golshifteh Farahani, EXODUS: GODS AND KINGS), keep on their kitchen counter in their very modest bungalow. And that’s all that happens! There are no lasers, no explosions, no one dies and nothing morphs into something else. And that’s okay. PATERSON just follows Paterson from Monday to Sunday as he finds poetry in the things we all take for granted. We’re so conditioned to think that something has to happen in movies that we expect that something will happen if not to Paterson, then to Laura or Marvin. But PATERSON is just a story about a simple guy with simple dreams living a simple life. He’s happy being a bus driver, he’s happy to be with Laura and to support her in all her flakiness, and he’s happy writing his poetry. Even when Laura pushes him to get his poetry published, he resists, saying that it’s just for them to enjoy. Both PATERSON and Paterson are throwbacks to an earlier time, before the Internet, 250 channels on TV and fake news. Humorously, when Paterson’s bus breaks down, he has to borrow a passenger’s mobile phone to call for help because he doesn’t own one himself. People who have grown up only knowing mobile devices and instant communication may struggle relating to either the character or the film. But it’s both the film’s and the character’s simplicity and honesty that makes them so endearing. PATERSON is not to everyone’s taste. If you’re more into having a can of Red Bull than a cup of hot tea on a rainy day, you’re going to be looking at your watch after 30 minutes. But if you’re prepared to settle on back into your cinema chair for a couple of hours, you’re going to be treated to something very special.